ANTON KARAS - Viennese zither player, best known for his soundtrack to CAROL REED's 1949 adaptation of The Third Man. CARMINE COPPOLA - American composer, flautist, editor, musical director, and songwriter, at the Internet Movie Database. CRAIG ARMSTRONG - Scottish composer of modern orchestral music, electronica and film scores, at the Internet Movie Database. ELMER BERNSTEIN - American composer and conductor best known for his many film scores, at the Internet Movie Database. ENNIO MORRICONE - SERGIO LEONE's favorite composer, at the Internet Movie Database. Francis Lai - French accordionist and composer, noted for his film scores. In 1965 he met filmmaker Claude Lelouch and was hired to help write the score for the film A Man and a Woman. Released in 1966, the film was a major international success, earning a number of Academy Awards. The young Lai received a Golden Globe Award nomination for "Best Original Score". In 1970 Lai won the Academy Award for Best Music, Original Score and the Golden Globe Award for Best Original Score for the film Love Story. 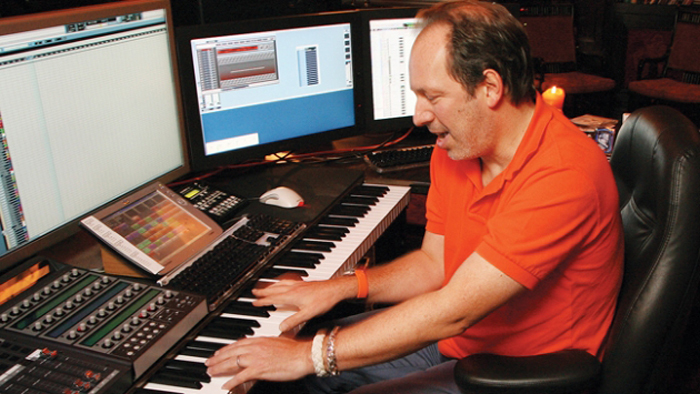 HANS ZIMMER - German composer and music producer, at the Internet Movie Database. James Horner - (1953-2015). Was an American composer, conductor and orchestrator of film scores. He was known for the integration of choral and electronic elements in many of his film scores, and for his frequent use of motifs associated with Celtic music. Horner's score for Titanic is the best selling orchestral film soundtrack of all time while Titanic and Avatar, both directed by James Cameron, are the two highest-grossing films of all time. At the Internet Movie Database. JOHN BARRY - English film score composer, at the Internet Movie Database. Best known for composing 11 James Bond soundtracks and was hugely influential on the 007 series' distinctive style. JOHN MAUCERI - American conductor, producer and composer for theatre, opera and television, at the Internet Movie Database. JOHN WILLIAMS - American composer, conductor, and pianist. In a career spanning six decades, he has composed some of the most recognizable film scores in the history of motion pictures, at the Internet Movie Database. He has had a long association with director Steven Spielberg, composing the music for all but two (Duel and The Color Purple) of Spielberg's major feature films. LALO SCHIFRIN - Argentine composer, pianist and conductor. He is best known for his film and TV scores, such as the Mission: Impossible theme, at the Internet Movie Database. MAURICE JARRE - French composer and conductor best known for his film scores, at the Internet Movie Database. Max Steiner - (1888-1971). Austrian-born American composer of music for theatre and films. He worked in England, then Broadway, and moved to Hollywood in 1929 where he became one of the first composers to write music scores for films. Steiner is referred to as "the father of film music" and is considered one of the greatest film score composers in the history of cinema. Along with such composers as Dimitri Tiomkin, Franz Waxman, Erich Wolfgang Korngold, Alfred Newman and Miklós Rózsa, Steiner played a major part in creating the tradition of writing music for films. Steiner composed over 300 film scores with RKO and Warner Brothers, and was nominated for 24 Academy Awards, winning three: The Informer (1935), Now, Voyager (1942), and Since You Went Away (1944). Besides his Oscar-winning scores, some of Steiner's popular works include King Kong (1933), Little Women (1933), Jezebel (1938), Casablanca (1942), and the film score for which he is possibly best known, Gone with the Wind (1939). At the Internet Movie Database. MICHEL LEGRAND - Franco-Armenian musical composer, arranger, conductor, and pianist, at the Internet Movie Database. NINO ROTA - world-renowned Italian composer and academic who is best known for his film scores, notably for the films of Federico Fellini and Luchino Visconti. He also composed the music for two of Franco Zeffirelli's Shakespeare films, and for the first two films of Francis Ford Coppola's Godfather trilogy. At the Internet Movie Database. Vangelis - Greek composer of electronic, progressive, ambient, jazz, pop rock and orchestral music, under the artist name Vangelis. He is best known for his Academy Award-winning score for the film Chariots of Fire, composing scores for the films Blade Runner, 1492: Conquest of Paradise and Alexander, and the use of his music in the PBS documentary Cosmos: A Personal Voyage by Carl Sagan. At the Internet Movie Database.